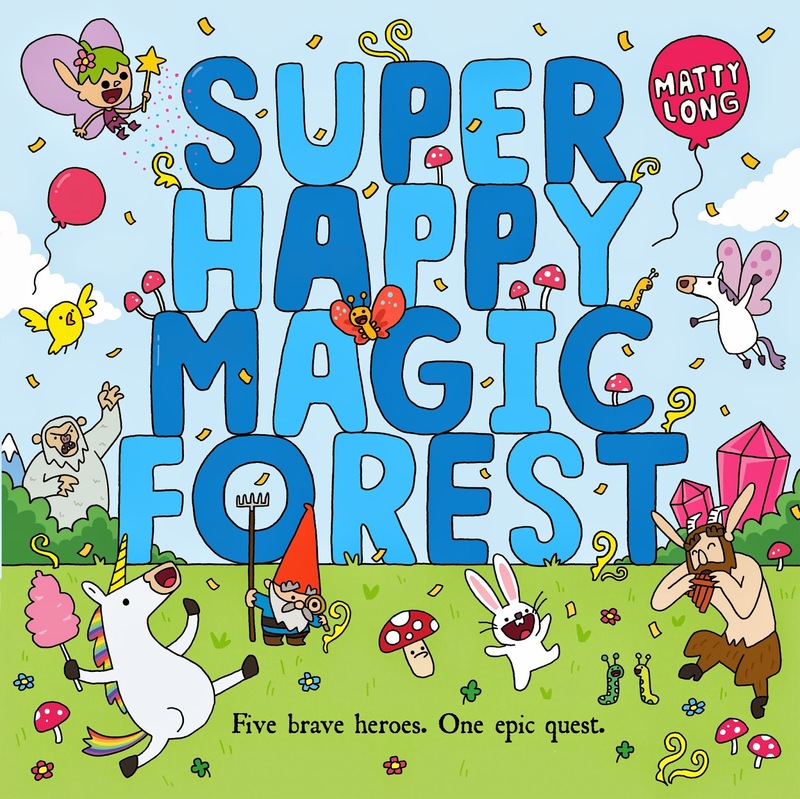 Debut picture book author and illustrator Matty Long shares his love of fantasy and bringing brand new magical worlds to life in his first picture book, Super Happy Magic Forest. Super Happy Magic Forest is a tale of brave heroes, fearsome enemies, epic landscapes and sweet, sweet fig rolls. The idea came about a couple of years ago when I was struggling to think of a project that I could work on and take to the Bologna Children’s Book Fair to show to publishers. 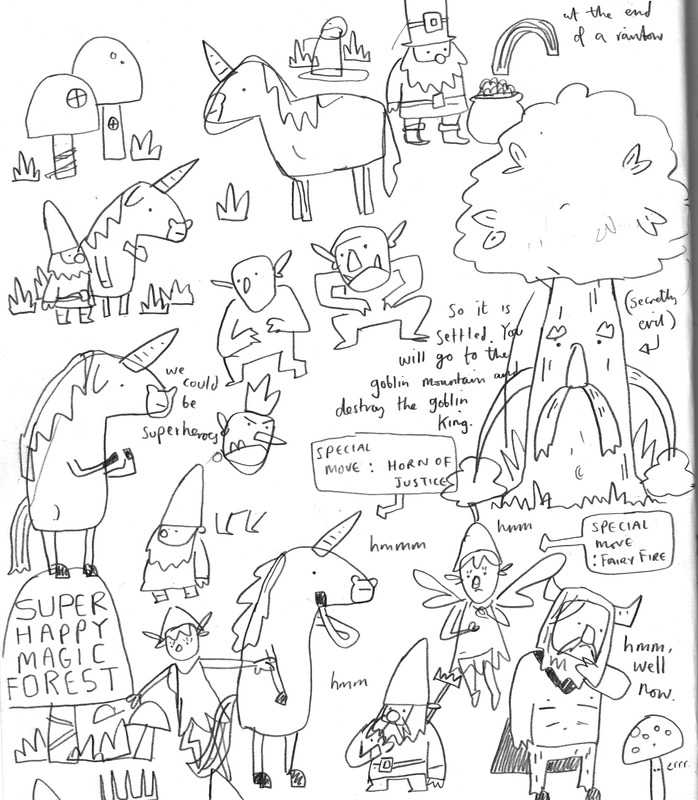 I began filling sketchbook pages with gnomes, unicorns, and bare-chested, goat-legged men. 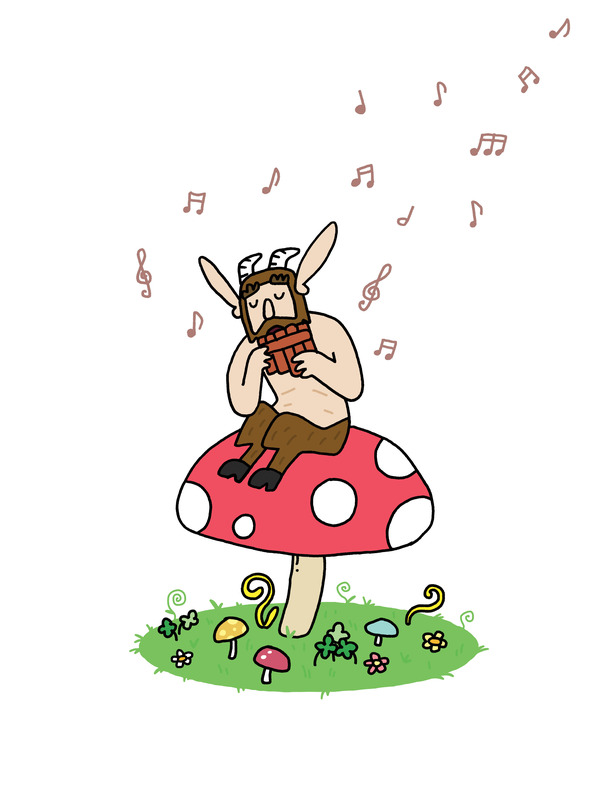 Or ‘fauns’ as I guess they’re more commonly known. And then I was drawing fairies, bunnies, trees with faces. It wasn’t until I drew the words SUPER HAPPY MAGIC FOREST in a mushroom that I suddenly had a home for these creatures, and the thought that I may actually have an idea worth developing. There were a few times when I dismissed it all as too outlandish and not sensible enough (It isn’t). But that was half the fun! It was useless to resist. I have always been a huge fan of fantasy. There is unlimited potential in worlds filled with magic, monsters, good and evil. And there are no rules! 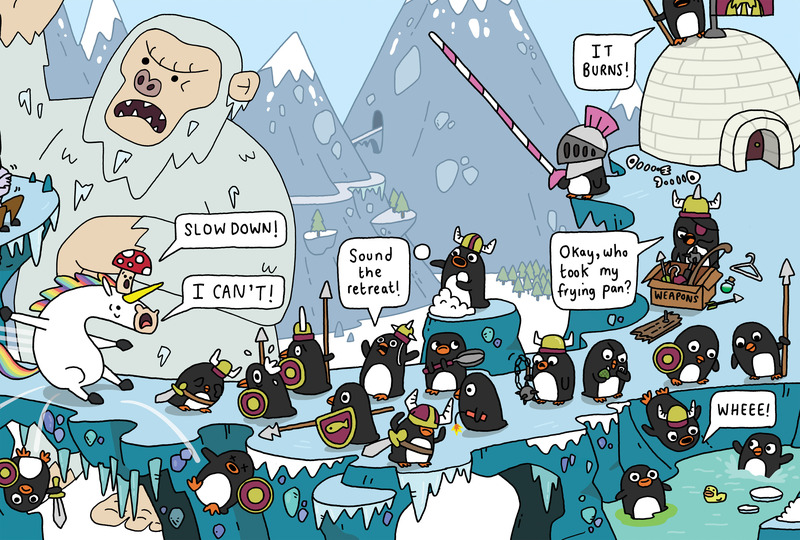 Penguins can be warriors. Mushrooms can talk. 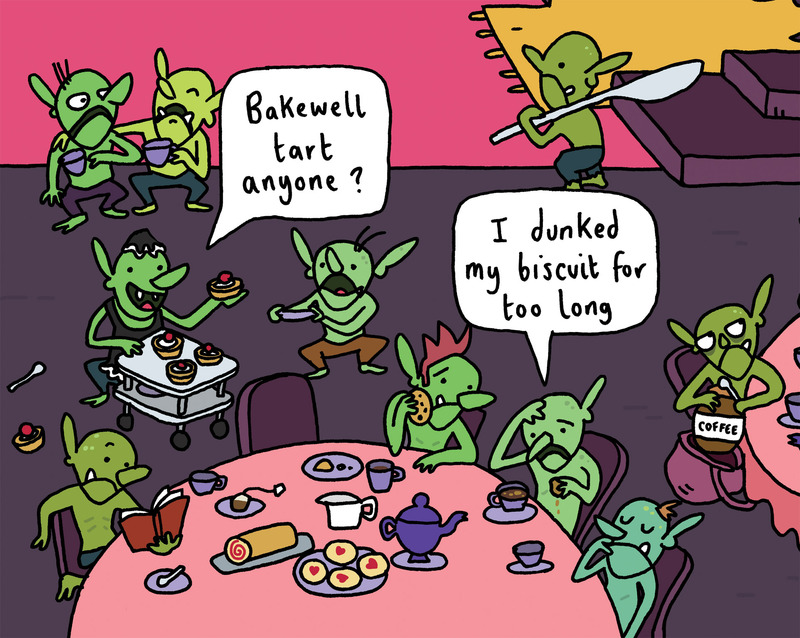 Goblins don’t HAVE to be bad. One of my favourite parts of making Super Happy Magic Forest was designing the detailed locations that the Heroes have to fight their way through. It is a great opportunity to really make their world come alive. On some of these pages there are prompts to look for certain items or creatures. It’s a device that hopefully acts as another level of engagement while ensuring the reader sticks around a little longer to take in everything that’s going on. I’ve always appreciated detail, and images that reward you for taking the time to really look at them and uncover their secrets – Martin Handford’s Where’s Wally? books are a great example. As much as I adore fantasy, I can’t deny that there is also a degree of silliness to fairies and unicorns, and in some of the overblown cliché’s within the genre: A dark lord rising. Items of great unimaginable power. Brave heroes of virtue and courage. It’s a lot of fun to play around with these conventions, and while the main worded narrative pays tribute to them, often the pictures tell a slightly different story. 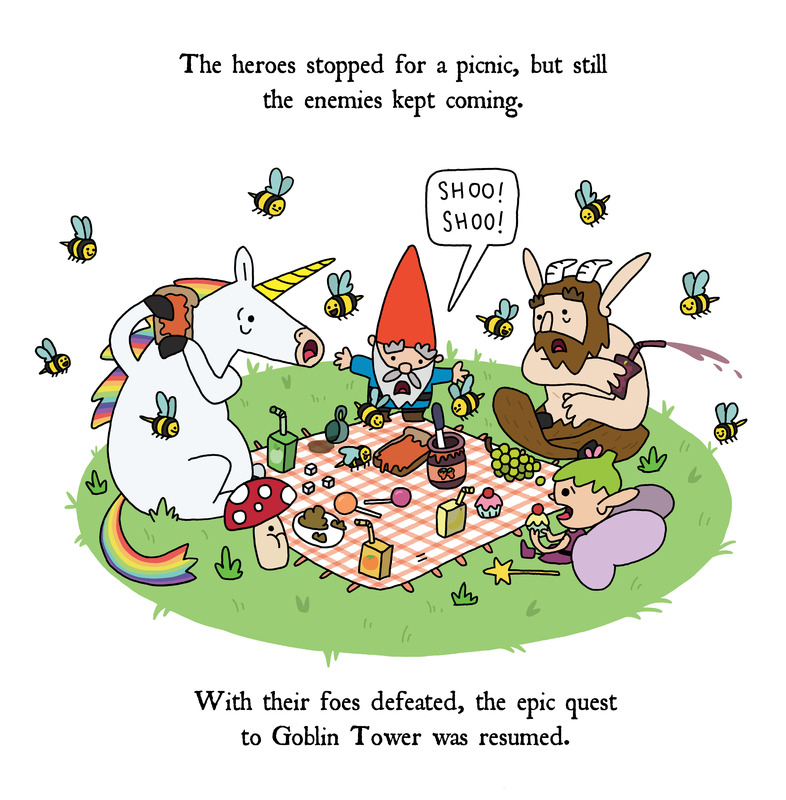 I really hope that Super Happy Magic Forest can introduce readers to the world of fantasy and can give them at least some of the pleasure that I’ve taken from it over the years. Super Happy Magic Forest is out now. Matty Long has a First Class Degree in Illustration from Southampton Solent University and a Master’s Degree in Children’s Book Illustration from Anglia Ruskin University (Cambridge School of Art). 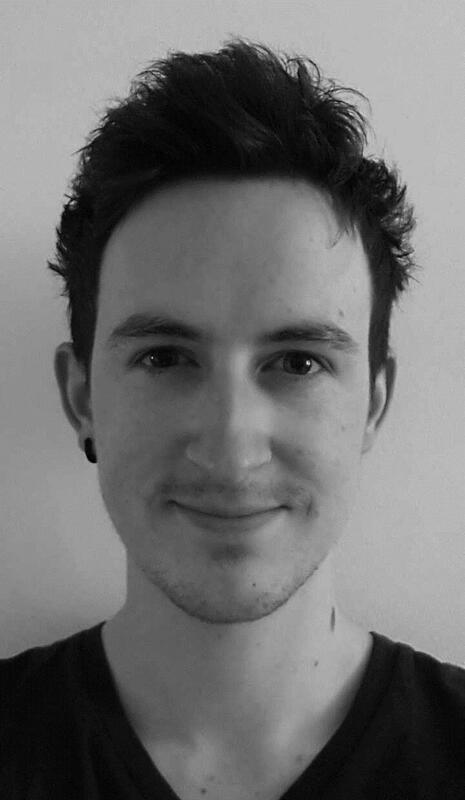 He graduated from Anglia Ruskin in 2011 and has since been working at a bookshop in his home town of Cambridge, developing picture-book ideas in his spare time. Matty is twenty-seven years old. Super Happy Magic Forest is his debut picture book. He’s currently working on the sequel!